Today we take a look at Martin’s delightful D-16RGT – part of the iconic brand’s 16 Series, which takes designs from their premium Standard Series and makes them more affordable and accessible. Sounds pretty good to us so far. After all, who wouldn’t want a Standard Series-inspired acoustic for under $2,000 – nobody. Let’s check it out! On the Martin scale, the D-16RGT is actually quite mid-range, although when compared to other acoustics, this is a premium guitar – certainly as premium as many casual guitarists will go. Which is fine, because you really do get a high-end guitar, which is impeccable in its construction and overall feel, while offering a good dose of elegance. It’s made in the USA, and its quality and craftsmanship show. Martin uses only solid wood to craft the dreadnought body, with solid Sitka spruce on the top, and solid East Indian rosewood back and sides. The body decoration is subtle but oozes style, with a glossy finish, white binding, a faux tortoiseshell pickguard, and a cool herringbone soundhole rosette. Unlike the body, the neck – joined at the 14th fret – features a satin finish, and an eco-friendly black Richlite fretboard, with 20 frets in total. The use of Richlite won’t appeal to wood purists, but it looks good and plays like warm butter. The D-16RGT doesn’t feature any electronics, but its hardware is appropriate for both its style and the price you pay. There’s a set of Martin-made sealed chrome tuners, which are a pleasure to use – as you’d hope at this higher-end price. The guitar is strung with Martin SP strings, while there’s a Richlite bridge, a White Corian nut, and compensated white Tusq saddle. Throw in the accompanying hardshell case and you have a decent haul when it comes to hardware. You don’t really need electronics when you have a sound this big! The D-16RGT boasts a huge, deep projection – the result of the dreadnought body, the scalloped X bracing, and the solid construction. The tone is incredibly sweet, rich, and very well balanced, with great dynamics and a lengthy sustain. Even better, the tone should open up in warmth and volume over the years, thanks to the use of solid wood. It’s excellent for fingerstyle playing, but perfect for enthusiastic strummers. In fact, it sounds superb whatever style of music you throw at it. Truth be told, you can find a better value acoustic out there, but it’s hard to complain when you’re receiving a Martin that looks, plays and sounds this good. For professional guitarists and the casual player alike, it’s a guitar that – if looked after – will last a lifetime and sound better with every passing year. For that alone, it’s worth the cash. 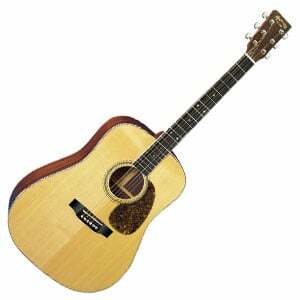 For more info about the Martin D-16RGT, click here. For more Acoustic Guitars Under $2,000 you might like, click here.